When is the Best Time To Skydive? Spoiler alert: skydiving is great any time of year, any time of day! But we all have our favorite seasons and other personal preferences, so let’s explore all the options. Here is our guide to picking the best day for your jump. What do you get that friend that one friend that only talks about skydiving? Everything skydiving related, of course! Here is our official guide to making your favorite skydiving junkie so EXTREMELY happy this holiday season! Manifest (that's what we call the "office" at the dropzone) is the coordinating center of all of the skydiving operations. It's the team on the ground that makes sure all the cogs in the skydiving wheel are oiled up and running smoothly. Today we're giving you a peek behind the scenes of our operation and the life of Team Manifest! How to find him - You can't. Mikey just appears and disappears as he pleases. He is a supercharged Houdini. Skydiving for the first time is truly the adventure of a lifetime. When you are ready to take the leap and start researching the best place to go, you definitely want to pick the skydiving center that won’t disappoint. When choosing where to have your first skydiving experience, as with any extreme sport, you want to be in good hands of experienced and professional people. So what are the things you really need to check for? Rennay is our "dropzone mom". She is an A licensed skydiver who somehow manages to take care of everyone at the dropzone, from bringing snacks to cheering up students to just being there for everyone. She is one of those people that absolutely everyone enjoys hanging out with, and we are so happy that she calls Cross Keys her home dz! Nobody really remembers when the tradition of the skydiving Easter Bunny started at Cross Keys, but hundreds of local families know to come to Cross Keys on Friday before Easter every year to watch this unique show. Sarah is the Chief Packer at Cross Keys, and has been a Chief Officer of Fun / Event Organizer for many years. If you're a regular at CK, she probably packed your parachute at least once, and for sure heckled you from the packing mat more than once! A professional skydiving center in NJ, near Philadelphia and New York. 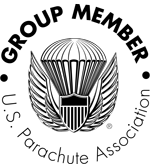 Open year round, we offer first time tandem skydiving, skydiving training and licensed skydiver jumps. "There is absolutely nothing that I have experienced in my life that compares to the rush skydiving gives off. There are tons of pics and a real good video that I will never get tired of viewing and showing to my friends and family. I should have skydived sooner in my life. I've been missing out! If I could rate this a 6 out of 5, I would. Yes, I'd do it again, and again, and again, and again..."
"The tandem jump was the best time of my life! I'm so glad I did it at Cross Keys. The staff is very professional and friendly. And I loved my freefall video. Definitely coming back soon!" "This is actually one of the best places I have been to. The crew is really awesome. Thank you guys for giving us such an amazing experience!" "Absolutely amazing!! My instructor not only got us to the ground carefully, but also made me feel safe while also maintaining the excitement (even after the last second nerves kicked in). They did a phenomenal job with my photos and video (worth EVERY penny). The excitement is unmatched!! If you're thinking about skydiving, I would definitely recommend Skydive Cross Keys!!"